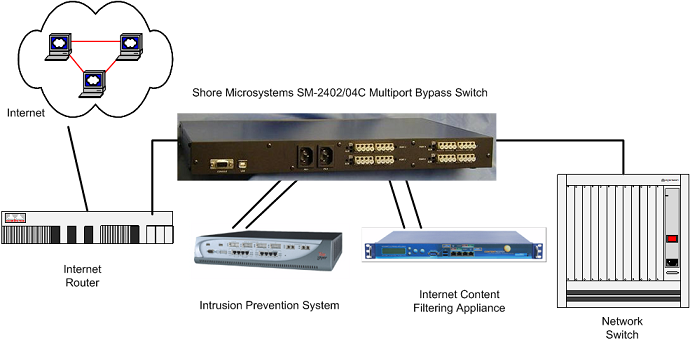 The SM-2402/04F Multiport Programmable Bypass Switch provides the ability to automatically bypass a malfunctioning network appliance. The unit operates in a standalone mode or as an intelligent watchdog that expects periodic interaction with a properly-functioning network appliance via a serial communication link. In the event of a failure, the unit removes the failing device from the Ethernet link. After bypassing (removing) the failing device, the SM-2402/04F directly connects the two external Ethernet ports to reestablish end-to-end communications. The unit is available in several configurations for end-user or OEM applications.